Lake Country - Molded Urethane Backing Plate 6.25"
Lake Country Molded Urethane Backing Plate 6.25"
The Flexible Backing Plate LC-43-160 measures 6-1/4”. 5/8" x 11 or 14mm Thread Size. This material is flexible yet incredibly durable. This plate will last through countless, rigorous uses without falling apart or becoming unbalanced. 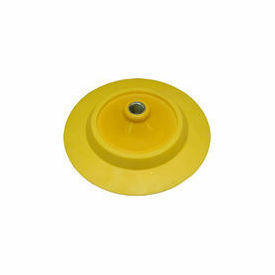 Lake Country - Molded Urethane Backing Plate 6.25" The Flexible Backing Plate LC-43-160 measures 6-1/4”. 5/8" x 11 or 14mm Thread Size. This material is flexible yet incredibly durable. This plate will last through countless, rigorous uses without falling apart or becoming unbalanced. Balancing is essential when it comes to polishers because an unbalanced plate will bounce, leaving an uneven finish. T The reinforced inner construction uses steel struts molded into the center hub to give the plate stability and maintain an even surface for your pad.